This isn’t something you see very often in our house. Four pairs of shoes (size 8 -13) all nicely polished and lined up by the front door. It was a nostalgic reminder of a ritual from growing up. Placing the finished article in a neat row by the kitchen door, ready for Monday morning. Taking care of valued possessions. The act of cleaning the shoes was about making sure they were fit for purpose. Also prolonging their useful life through repair and maintenance. I really did cherish my rugby boots. Taking care of others. Thinking back I did enjoy the thought of having my siblings, mother and grandmother wear shoes I had looked after for them. My strongest sense of pride however came from cleaning my father’s shoes, even the terrible tan colour ones I could never find a polish to match. (My brother once threw up in those shoes – something weirdly symbolic in that I’m sure). Making the best use of my time. This probably came from my time in the Cub Scouts. I always used to feel justified that I had done something useful with my time on a Sunday evening, setting me up for school on Monday. My kids claim that they know nothing about the process of polishing shoes, due to my poor parenting skills they inform me. Apparently they aren’t alone. I had to buy some polish in a local shop this week which was slightly odd. First off the polish was kept behind the counter. I can’t fathom out why. It’s hardly dangerous medicines or high cost like the vodka they keep there. Perhaps it was because they didn’t know what shoe polish is? The young guy serving said that he had never used shoe polish and asked how it worked. I did explain. I then got a guided tour of his £90 trainers that last him about six months. Great, I was heading off to polish some shoes I’ve used for two years and have had re-soled and re-heeled twice. I walked away with the distinct impression that he thought I was some weird old codger. For the benefit of my local shop worker and my kids, here’s a video on how to polish your shoes. I hope they watch this. On their behalf I have picked one of the better videos with a really cool guy, with cool clothes and nice hair. Perhaps they will learn something from him rather than me. On a positive note, I did notice that my middle son had cleaned his rugby boots last week, first time ever I think. OK, the sink was full of mud and the draining board was covered in grass, but it’s a start. At least he’s stopped asking his grandmother to do it. Rituals and routines are important as a way of making sense of the world around us. They can also help surface memories and patterns of how to do things. It helped me get back into the school week, perhaps I should resume it for work? Training shoes have a lot to answer for. Photo Source. It’s one of mine, as are the smallest pair of shoes. All so true and a valauble reminder. My son’s in the £90 trainers lasting for 6 months league but at least my shoes are bigger than my daughter’s! Getting difficult to find anyone with smaller feet than me in our house. I used to get some natty hand downs, but they are a bit too big nowerdays. I put it down to a rubbish 1970s diet growing up. 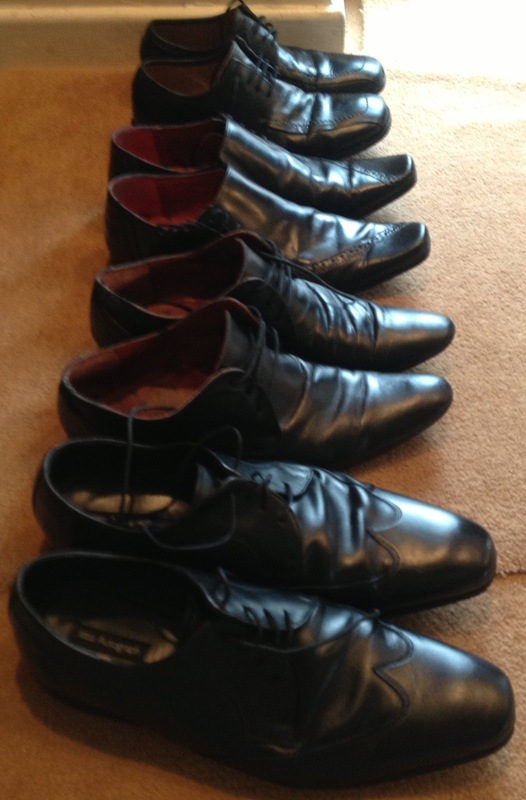 A friend gave me some of his shoes on Saturday for our ‘Wardrobe’ in Lichfield. He said he couldn’t resist giving them a polish first. Was telling him about this blog post. I’m very impressed by your search function. Typed in ‘shoes’…….and there it was! Now duly shared with said friend. I’ve just reminded myself of that post. It may have been the last time my kids actually had polished shoes. Now the summer has arrived, lucky to see any shoes full stop. Good that the search worked so well, all down to the wonders of WordPress. Hope your friend enjoyed the post.